After a year of discussions and negotiations, members of the Forum for Democratic Dialogue (FDD) this week announced the official formation of a new opposition coalition to contest next year's general election. FDD, only a discussion forum of six political parties until now, included two newcomers to now stand as a group of eight political parties and two former ruling party senior politicians: former president Negasso Gidada (PhD) and ex-minister of defense Siyee Aberha. Early this week the group members submitted a letter to National Electoral Board of Ethiopia detailing their decision to form a new coalition that should last for five years after next year's national election. In a press conference FDD leaders held last Thursday they announced that a founding congress for the new coalition will be held in a month's time to unveil the composition of the new coalition. An outline of the forum's program is expected to be unveiled shortly ahead of next month's founding congress. The new coalition, upon accreditation, would be the first attempt of the opposition camp to form a strong grouping after the former coalition for Unity and Democracy (CUD) historic 2005 national election success, which was later overshadowed by the imprisonment of some of its leaders and the coalition's disintegration. Local political commentators say the forum's composition is a unique one, even stronger than former CUDP's, as both ethnically-based groups such as the Oromo Federalist Democratic Movement (OFDM) and national groups such Birtukan Midekssa's party Unity for Democracy and Justice (UDJ) are included. UDJ, a new strong addition to the Forum after the party's leaders, in two groups, debated for months whether to join or not, currently is the strongest in the coalition in terms of members. UDJ's over 40, 000 members is the highest one for both for the forum's members and the entire opposition camp, though the ruling party's women's league in Addis Ababa alone has close to 44, 000 members. After UDJ chair Birtukan's pardon was revoked and she begun serving a lift sentence she received after the fallout from the 2005 elections, those who were advocating joining the forum are believed to gain momentum. This did not stop party elders, such as Professor Mesfin Woldemariam and Shimeles Tekelsadik (PhD), putting up a fight to try and stop the party from joining. After losing in votes both in the national and executive committees of the party, Professor Mesfin and the other twenty senior members vowed to continue to fight against what they say will endanger the party's fate. They claim it is being led in a destructive direction because of the executive's irresponsible and undemocratic measures. The executive in turn sent the group's case to a discipline committee, citing some of the statements the group published in various media outlets as illegal ones that trashed the party's leaders with unfounded allegations. 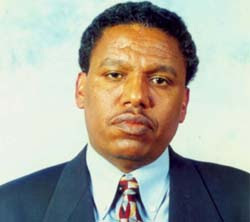 First Tamrat Tarekegn, a member of the executive committee, was fired from the party on charges of leaking secrets. In a rather controversial move, the veteran opposition mastermind Professor Mesfin, along with eleven other members, including Dr. Shimeles, were fired by a majority vote of the party's national council meeting, which was held a week ago. Another eight members were suspended for three months. For the UDJ rebels, the presence of former minister of defense Siyee Aberha, who was among founders of the ruling party's Tigrian Peoples' Liberation Front, in the forum is more than suspicious, as they openly criticised the move that they say would endanger the fate of the opposition. Some articles described the former ruling party's influential senior cadre as a ticking bomb that could blast the opposition unexpectedly. "I am from Tigray and I am an Ethiopian, everybody knows that. I led TPLF and its army to bring down the military junta and I have no regrets whatsoever for doing that," Siyee said last Thursday addressing the issue in an emotional tone, "the factor that made me stand with the ruling party is my principles and I stood for those principles even if I knew what standing against the Prime Minister would entail. "So I am not afraid of any political or physical prosecutions to stand for the principles that brought me here with the forum members." Seye, alongside his former colleagues at the TPLF, Gebru Aserat party's Arena Tigray for Democracy and Sovereignty (Arena) is expected to win support for the opposition in Tigray and other areas the ruling party is particularly strong in.